For a long time, your main option for roofing materials was asphalt shingles. Few other choices were available, and if you wanted a different roofing material, you had better be prepared to pay top dollar for it. Standing seam metal roofs were only a figment of the imagination in the minds of average homeowners. Most metal roofs were confined to commercial buildings or only to very cool, very expensive architect-driven residential structures. Now, they seem to be popping up on every block. Will standing seam metal roofs supplant composition shingles as the roofing material of choice? Asphalt and composition shingles do have their high points, and they are not going away anytime soon. For one, if you want to purchase a dead-cheap roofing material, asphalt and composition tend to be the way to go. There are two problems with composition shingles, though. First, the cost of composition shingles is influenced by oil prices, as they are derived from petroleum. This means that prices can fluctuate due to pressures outside of the roofing industry. Second, composition and asphalt shingles tend to lose surface material. If you have ever cleaned out your gutters (assuming you have asphalt shingles), you know quite well how these shingles have a propensity to slough off the upper mineral-based surface. After enough seasons, conventional shingles have literally been worn down to the core. Sweeping the shingles or, worse, power washing them will only speed up the process. Standing seam metal roofs are a completely different product. Not only is the type of material independent of petroleum prices, but the size and shape of the material and its installation methods are different, too. Many homeowners find that the higher initial cost of this type of roofing will pay off in the end because of its greater durability and reliability. 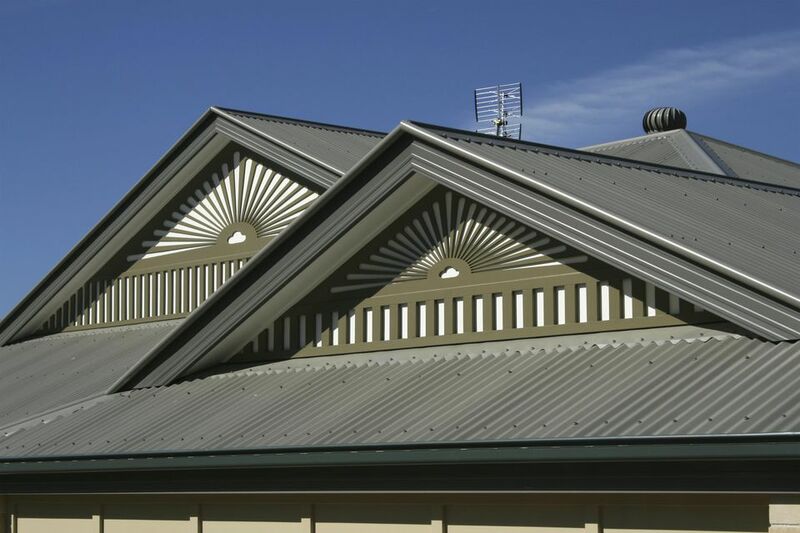 Standing seam metal roofing is a particular type of metal roofing that raises the seams above the level of the roofing itself. This is where we derive the term standing seam, because the seam is raised, or standing, as opposed to flush-mounted. Because seams are always the weak point with any kind of building material, especially roofing, raising the seams above water level is a key advantage. Pre-formed vs. Site-formed: Roof panels can come either pre-formed or site-formed. Pre-formed panels are created in an off-site factory. Site-formed panels are created from rolls of metal that are run through mobile forming machines that crimp the metal into rigid panels. Durable: Metal is tough and durable, but it's not impervious to all hazards. The sheet metal in this type of roofing can be penetrated by heavy falling limbs or dented by a severe hailstorm. "Cool Roof": All metal roofing, in general, is considered a "cool roof" by the US Environmental Protection Agency. This is because metal roofing can be painted any color, including colors on the lighter end of the spectrum which will prevent solar heat gain. Composition shingles are difficult to paint. Sleek Looks: Standing seam roofs are perfect for certain types of contemporary or country-style houses. Due to the smooth, straight lines, these roofs give your house an industrial feeling—yet with a modern flair. These are not the rippled tin roofs that you might remember from warehouses of the past. Multiple Colors: Metal roofing comes in a decent array of colors: grays, browns, forest greens, earthy reds. While this is not the full palette of colors you might find at a paint store, it is far more than you will find with composition/asphalt shingles. Fewer Roofers: Nearly every roofing company in your area can install composition or asphalt roofing shingles. But far fewer contractors install metal roofing, and fewer still install them well. This means that you will search longer for a good roofer, and the total project cost may be higher because competition in the market is lessened. Unsuitable for Flat Roofs: Roof pitch refers to the angle of the roof's slope. Certain types of metal roofs do not lend themselves well to flatter (or completely flat) pitches. Snap-lock panel metal roofs are not advisable for roofs with a pitch of 2:12 or less (2 feet of vertical rise for every 12 feet of horizontal rise). However, with a better quality mechanically-seamed panel, it is safer to go to a 1/2:12 pitch. You can even bump the seams up to 2 inches with a butyl seal for those applications. It is important to note, too, that when you get to these lower pitches, you are below the recommended minimum pitch even for conventional shingles. Generally, these safely go down to a 4:12 pitch, with some shingle manufacturers warranting their product down to 2:12. Cost: Metal is considered a moderately expensive roofing material, more expensive than conventional shingles but less than high-end slate or copper. However, metal's higher cost can be amortized via its longer lifespan. Not a Panacea: While metal itself is fireproof, many factors contribute to make a house a fire hazard. Some homeowners may be lulled into a false sense of safety with their metal roofing, believing it will render their home completely safe from all fires.